Are you the adventurous type? Our Shark Adventure Dive was created for people who enjoy diving but want something just a little different and a little more on the adventurous side of things. The dive is a two tank dive program that safely introduces divers to the wild sharks that swim off the coast of the Bahamas. This dive is meant to create the experience of a lifetime with an up close and personal view of these amazing, and too often misunderstood, creatures of the sea. We currently have a total of four shark dive locations. On your dive you will visit two of these locations. You will either go to our Shark Wall first and then The Arena, or you will explore the Runway Wall and then the Runway. 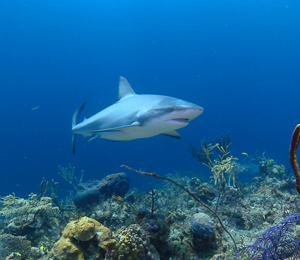 At all of these locations you should expect to come into a world filled with the Caribbean Reef Sharks. The first dive is a free swim where you will jump into a world of reef sharks. The sharks will be curious about your presence but they will keep your distance, particularly since no bait is exposed to the sharks in this dive. This dive creates a scenario where you are among the sharks' natural behavior in the wild. In the second dive, you will be exposed to the amazing display of shark feeding. During this dive, you will spend most of the time kneeling on the sandy sea floor looking up at the professional shark feeder as he feeds the hungry sharks. The guide uses a pole spear in order to safely control the release of the food. In this dive, the sharks will definitely come close but you can rest assured that what they are interested is the food the humans are providing them and not the humans themselves. This dive will definitely keep your heart pounding and your blood flowing! It is not for the weak hearted but you can be sure that it is safe and our trainers will keep you safe throughout your two dives. This is definitely one diving excursion you are sure to never forget! What Goes On During A Shark Dive? This dive is a two-tank dive. Your first dive will typically be a free swim with the sharks at a dive site named the Shark Wall. This wall is located right next to one of the feeding sites used on this dive, so when the boat pulls up the sharks know its feeding time. The second dive is a feeding dive with the feeding done by the shark feeder. This dive can get really exciting as the sharks seek out their free meal. Complimentary pick up is provided from all hotels and cruise ship areas. What are water conditions like? All dives occur on the south side of the island where waters conditions are great all year round. Visibility remains clear and consistent all year round. Water tempatures change seasonally but average between 72 - 78f. Wetsuit rental is required for this dive (fees apply, see below). All divers must have an Open Water certification or higher, and have a dive logged within the past 2years. Cruise ship passengers must be in port until 7pm or later for this tour, and arriving NO LATER than 11am to make the pick up time. I have been to the Bahamas many times, but Shark Adventure Dive is one of my favorite trips! It includes everything that everyone should do here. As a Bahamas veteran, I can say only the best about this experience!